Katana the Hokkaido Ken at 1 year old — "Katana is a Japanese import. He is very high energy, has lots of prey-drive and shows promise as a hunting dog. He gets along great with people and larger dogs, but needs supervision around small dogs and cannot be trusted around other animals. He is very active and agile and is a great hiking partner and loves to chew. He is loud and talks a lot and screams or howls if he gets frustrated. He loves to cuddle, is very affectionate and quite attached to his owner." The Ainu Dog is a thin, muscular, sturdy-looking dog. It is impulsive, fast and has a light gait. Ainus have small, erect ears that are at a right angle to the brow. Its eyes are somewhat small, dark brown and set triangularly. The teeth are healthy, solid and non-protruding. Some have spots of black on their tongues. The bridge is straight leading to its dark nose. The well-fitted lips have dark pigmentation. The tail curls in typical Spitz fashion. The forelegs are straight and lean and the hindquarters are covered with a double coat. The harsh, straight coat colors come in sesame, brindle, wolf gray, red, brown or white. The Ainu Dog's character is packed full of desirable qualities. He has proven a fearless and determined hunter, watchdog, guard and defender, and at the same time, a loyal and well-behaved dog. They have also been used as sled dogs and scenting hounds and can be trained for defense. It is intelligent and quickly trained. This large game hunter is extremely courageous for its size, willing to attack a 650-pound bear! Yet it is still gentle, obedient and home-loving. It has an innate sense of direction and can therefore return to its master no matter how great the distance. 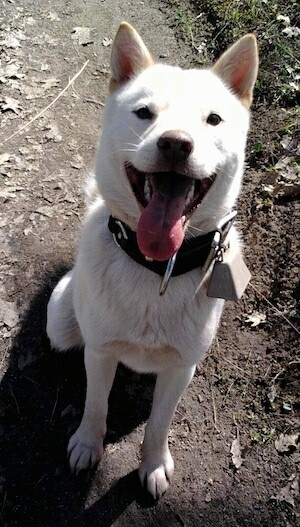 This is a typical Shika-Inu, or medium-sized dog. If its owners do not display true pack leader qualities it can become headstrong, stubborn and aggressive with other dogs. They need owners who understand what it means to be a leader and the differences between human and canine. Despite its long history as a working breed, the Ainu Dog ideally combines the roles of family pet and hunter. This breed should not be allowed to run free around other animals. They are good with children if they are raised with them from puppyhood and/or properly socialized. Children should be taught how to display leadership skills, and the dog should be taught to respect the child. The Ainu Dog is not recommended for apartment life. It is moderately active indoors and will do best with a large yard. They can live outdoors, for their warm coats protect them from the cold. The Ainu needs moderate but regular exercise to stay in shape. It should be taken for long daily walks. The harsh, straight, double coat of the Ainu Dog should be brushed and combed on a regular basis. The Ainu Dog is a Japanese Spitz breed rarely seen outside the country of Japan. The dog was named after the Ainu tribe. Origin is unknown. They arrived in Japan over 3,000 years ago when the Ainu brought this Spitz-type dog with them. As the Ainu were pushed onto the island of Hokkaido by an influx of Japanese people, their dogs gradually became restricted to this island. The dog's ever-alert and suspicious nature lent itself to the required role of village guardian. Their dog has changed little over the centuries. The Ainu Dog is probably the oldest of the Japanese breeds. It was later named the Hokkaido Dog, but is still better known as the Ainu Dog; indeed it is registered with the FCI under that name. Many Ainu Dogs have blue-black tongues, a physical trait that suggests a distant relationship with the similarly tongued Chow Chow and Shar Pei. Through the active work of the Society For The Preservation of Japanese Breeds, the Ainu Dog was designated a Japanese Natural Monument in 1937. The Ainu Dog has always distinguished itself in big-game hunting (especially bears), in guarding property, and as a draft animal.